This interview is part of the Infinite Fire Interview Series characterized by an open dialogue between the host and the conversation partners. The seed idea of this interview came about in an informal conversation between Esther Ritman and Punita Miranda when they were discussing the alchemical works that Jung had acquired in his life. Punita then decided to compare Jung’s personal collection of esoteric works, which have been digitised for the Swiss e-rara website as ‘Alchemy, Magic and Kabbalah’ (Foundation of the Works of C.G.Jung) with those in the Ritman Library Catalogue. The Jung and Ritman collections were found to hold several books in common and this sparked the idea of dedicating the next Infinite Fire Interview to the ‘Alchemy of the Psyche’, since Jung made such an important and influential contribution to the contemporary study of psychology and alchemy. We envisaged an open dialogue where 3 scholars from different backgrounds (a historian of alchemy, a historian of psychotherapy and a Jungian analyst) could discuss and explore alchemy and Jung, from the perspectives of intellectual and cultural history, as well as psychological practice. This seed eventually flowered and bore fruit when Professor Sonu Shamdasani of University College London, editor of Jung’s Liber Novus (also known as the Red Book), agreed to be the central figure in this project, to visit the Ritman Library in Amsterdam and talk about Jung’s attitude towards alchemy, in relation to his work on Liber Novus. 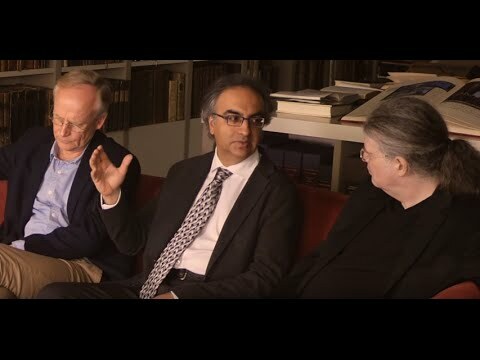 The other two participants in the dialogue were Dr Peter Forshaw, Associate Professor at the University of Amsterdam’s Center for History of Hermetic Philosophy, specialist in the history of medieval and early modern alchemy, and Dr Hans van den Hooff, a Jungian analyst based in Amsterdam. Esther and Punita drew up a list of questions, together with some quotes from Jung and used this as a way to initiate the conversation. The responses of the three interviewees, Sonu, Peter and Hans were spontaneous and unscripted. We would like to say thank you to the speakers for making this vision possible and hope that you enjoy what they have to say. Between 1928 and approx. 1940, C.G. Jung built up a collection of over two hundred early printed books on alchemy. In his works he analyzed them from a psychological point of view. Thus arose one of the most complete private collections of its time in the field of alchemy. It also includes other rare works in related areas such as magic, mysticism and Kabbalah, along with ancient books of dreams and literature of the Church Fathers.